I wrote a separate piece not too long ago on the topic of values. Reflecting on one’s own personal values—it’s something else that those with a resilient spirit do. Why would values reflection be important when evaluating a purchase or in deciding whether or not to move cross-country? Why think about values when looking for another job or when making the decision whether or not to enroll in classes, or whatever the issue may be? People who are rising above unfortunate circumstances and aiming for resiliency may come from a place of a lack of resources. This could be the contributing factor to the unfortunate circumstances some find themselves in. When resources seem scarce—be that in the way of money let’s say, or time—we neglect to stop and think about the things that influence our decision-making. Those things are our values. In times of constraint we often make decisions that are in direct conflict with the things we value because of the pressure felt. For example, one may value spending quality time with one’s partner. But in the competing interests of also needing to make money, that same individual might opt for the sales job that requires 90% travel at $150k per year even though it consumes his time. Similarly, one might consider oneself a law-abiding citizen who respects the rules of the road, but if that same person were driving to see a relative who had just been admitted to the hospital because of an emergency, they might shirk the value of stopping when at a red light and feel rushed to get to the hospital as quickly as they possibly could. How often do we pause to reflect on our values—to write them down even—not only write them down but prioritize them? This is a great thing to do periodically as our values change throughout the life span. The freedom to travel might have been more highly valued in one’s early 20s post college, with the year spent abroad in Germany and before transitioning to the daily grind of the 8am-5pm. That same individual in retirement years may find he has come to value his health more than the freedom to travel—post diagnosis of a chronic illness—even though he may have the money to do so. Alternatively, someone might have spent her early 20s in ill health only to find in later years her health improved and a regaining of the ability to do the things she wasn’t able to at a young age. It may actually be in her retirement years that she finally finds both the opportunity and the ability to travel. How do we go about prioritizing values? Prioritizing is about 1) knowing first what values we possess, 2) recognizing that those values change over time, 3) accepting that it is okay for those values to change, 4) having the ability and confidence to source out the higher ones when values are competing, 5) knowing that our values are influenced at times by circumstance, and 6) separating out what our own true values might be versus a value given to us by family, peer groups, or social norms. There’s been somewhat of a lull in my writing and posting lately on social media. It’s that feeling you get when you know you haven’t been to the gym in a while and you need to go—that feeling of muscle atrophy. I can’t remember when the last time it was that I’ve posted on this blog, it just seems like too long. And now as I glance to my left and look at the timeline, I see that it was July 11th. I guess that’s not so bad. Classes are going well. I’m very much enjoying the material. Sessions with clients are going great. I have someone whom I’m working with on this book publishing idea. All around things are going good barring a couple of minor incidents outside of work. It’s interesting shifting perspective from the material we’re covering in class, which centers around innovation dynamics and coming up with ideas for starting a socially conscious business, to clinical practice to this blog and then to the book(s) ideas. There’s just a lot going on right now. I love it! But it can be exhausting as well. But the older I get and maybe the more I realize that it’s impossible to be liked by everyone, the less I care if people like me. There are those walking around today who I know for a fact do not like me, and I’m actually okay with that. I’m okay with it because there are people in the world that I know that I don’t like. And somehow the world goes on despite all that. My not liking someone else is not a comment on their personhood any more than their not liking me is a comment on mine. We all have inherent worth and dignity and are deserving of respect. But if there comes a moment where I stand up for my values or there is some conflict in personality or there is some injury caused another, for example, I don’t let whether or not I will be liked get in the way of what for me seems like the right thing to do. Sometimes the right thing to do is simply to walk away. If not, I try not to waste time in proving to anyone that I am deserving of love and respect. But it’s not always easy. Once that trust has been breached and someone casts doubt in someone else’s mind of intentions it’s often hard to go back. And that’s okay too. Sometimes in life, we feel so disrespected it’s everything we can do to suppress the desire to PROVE. We want to prove to the other person that we are valuable, that we are in some sense worthy, or good, or even right about something. But that worth and value or goodness, for that matter, is not under review. It never is. And yet some people go about showing disrespect to others without any forethought. It’s not something to take personally. Sometimes, we ourselves are the ones showing disrespect without even realizing it. But by the same token, no one should be made to feel as though they have to tolerate that kind of behavior. In terms of being right, I’m willing to let that go as well over most things. I might lose the argument over whether or not it was right to speed if I had an important meeting to get to, but I don’t feel the need to argue or convince someone of the things that I know to be true or inherent. Those things are that we all carry inherent dignity, worth, and respect. We carry value simply as being human beings. These things are true whether or not our spouse cheated on us, whether or not we got the job, whether or not we have been bullied or harassed or sexually assaulted, whether or not our kids are talking to us at the moment, whether or not we got accepted into the academic program, whatever it is. I want to talk a little bit about existential psychotherapy since it is another modality I lay claim to operating within. For existential psychotherapists, a primary concern in working with clients isn’t so much about focusing on defects due to mental illness or flaws in character or personality. What existential psychotherapists want to get at in working with clients is to assist the client in uncovering where the client draws meaning and purpose in life and to encourage the pursuit of that meaning and purpose. Existential psychotherapy takes into account the fact that we all exist here on this earth and therefore have challenges in life to face as a result. But for each of us our existence precedes our essence. That before each of these statements about a person comes the verb “are”—people “are.” We exist. That’s the starting point for all of us. In a way, we are thrown into this existence. And because we exist and because human life is finite, the task becomes then to make something of our existence despite all the things that may have been thrown upon us at birth. For example, we may have been born into poverty, we may have been born with a genetic defect, we may have been born male/female, etc. Existential psychotherapy concerns itself with four dimensions of existence in particular—the physical, social, personal, and spiritual—and each of these dimensions has its own paradox. We break that down like this. At some point we will physically die. If we deny that our existence is finite, we run the risk of wasting the life that we have. If however, we keep within our awareness the idea that we will one day cease to exist, we might be motivated to live our lives more fully. The paradox of the social realm is that we exist on this planet with others. Our option is to either live in conflict or cooperation with them. Because we are aware of our separateness, we can develop the capacity to relate and respect the separateness of others. At the same time we are individuals with a need to be part of a greater whole. In the personal realm we discover that there are no hard and fast rules to life and that we all have vulnerabilities. Because of that, taking on personal responsibility becomes of way of creating rules for ourselves. If we deny our vulnerability and refuse personal responsibility we might lose the strength and stamina that come from the freedom to choose. We develop our own value systems outside of the context of absolute truth and this is where we relate to that which is unknown. We make up our own ideas for the reasons for our being here on earth and determine for ourselves what we believe to be right or wrong. Here, too, is where we create meaning and where we find purpose in life. This is where we get our worldview. This type of therapy is very future focused. It acknowledges that the past, though seemingly fixed, is in fact changing because our view of the past can change over time. In addition, life presents a certain amount of ambiguity and uncertainty and the goal often becomes developing the ability to tolerate the anxiety that this may produce. For existential psychotherapists the mind and body are connected and not functionally distinct. In other words, it’s not so much that we have a body but that we are a body. We are also connected to the world we exist in so that how we think about ourselves is often a reflection of our experiences with our environment and how we interpret the outer world. Because life is in constant flux and ever changing, the meaning that we make of our lives is also in flux, but to be able to make meaning of the life that we are in is an essential thing. The loss of a sense of meaning in life can lead to depression. We are all born into the world with assumptions and biases that influence our actions. The first step is to become aware that we have biases. That having been said, it is possible to do reality checks to verify our assumptions. This fits very nicely with cognitive behavioral therapy (CBT) which aims to look at evidence for and against negative core beliefs that we might have. 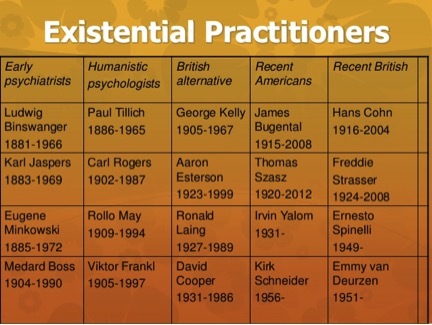 For more information on existential psychotherapy see Emmy van Deurzen’s work. Much of the information contained in this post comes from a class I took on existential psychotherapy with Skills in Existential Counselling & Psychotherapy by Emmy van Deurzen and Martin Adams as the text. 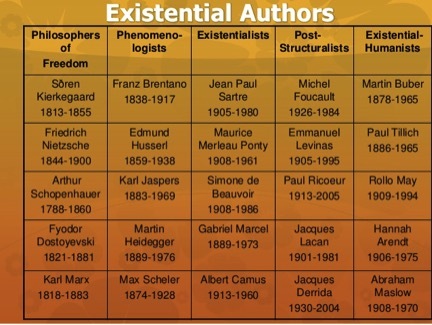 The following are existential authors taken from one of Emmy’s presentations. One of my favorite tools and techniques to use with clients is a value’s exercise. There’s a handout that I typically use that lists on one side several potential values a person may have and on the other side is a goal-oriented exercise. Why would a discussion of values be important when it comes to mental health?